Without a doubt, one of the best cities in the U.S. for dining out is Louisville, Kentucky. But the food in Louisville, good grief! It rivals larger cities in diversity, the chefs are insanely skilled (I went to a BAR that had a chef in the kitchen, not a cook but a full-fledged, classically trained chef), and the food is among the best I’ve had anywhere. Louisville would be on my top five list of cities to visit on a food-vacay. Ramsi’s Cafe on the World is often the first restaurant recommendation I receive when asking about eating vegetarian in Louisville. Not that there is a shortage of places to eat veg, but Ramsi’s seems well known. Fear not carnivores, a friend whose recommendations I trust in Louisville says she got the best hamburger she has had EVER at Ramsi’s. So it’s definitely more than vegetarian food that is done well here. 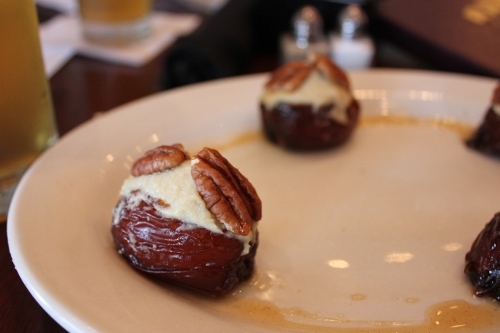 On a recent visit, we shared the Desert Jewels appetizer, Medjool dates stuffed with housemade cashew cheese, topped with spicy agave glazed pecans. The cashew cheese was the creamiest I have ever had and the pecans. Oh, those pecans. If they sold just the pecans, I would buy large quantities. 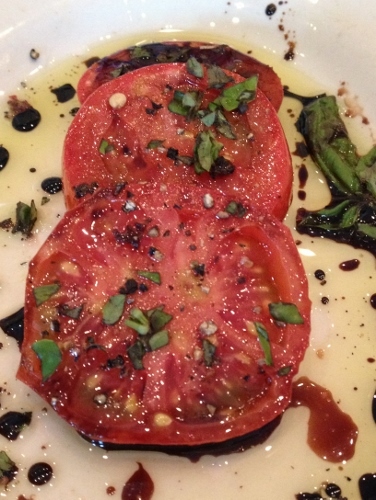 We also had a seasonal appetizer, sliced heirloom tomatoes and basil with a balsamic drizzle. Ramsi’s sources much of their produce from their family-owned farm, Raising Hope Organic Farm. While this qualifies as the most expensive tomato I’ve ever had (I believe it was an $8 appetizer), it was packed with that home grown mater flavor I love. Worth every dollar! For dinner, I had baked falafel with a dairy-free yogurt, tomato and cucumber salad. 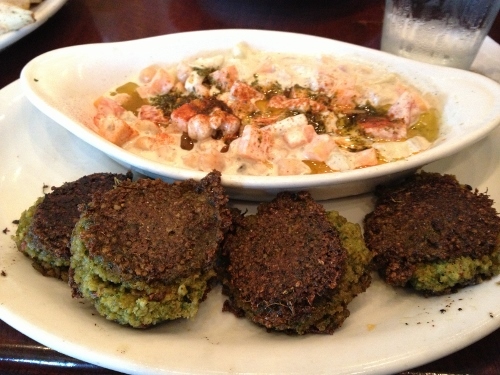 I eat a lot of falafel and this was a very good variation. I felt good about it being baked, knowing there was less chance of cross-contamination if it wasn’t cooked in a shared fryer. There was some confusion about whether gluten-free bread was available to go with this or not. Our server said it was not, then bread was delivered to the table and the server seemed uncertain if it was the gluten-free bread or not. We were able to verify that it was. I would skip the bread, but the rest of the entree was excellent. 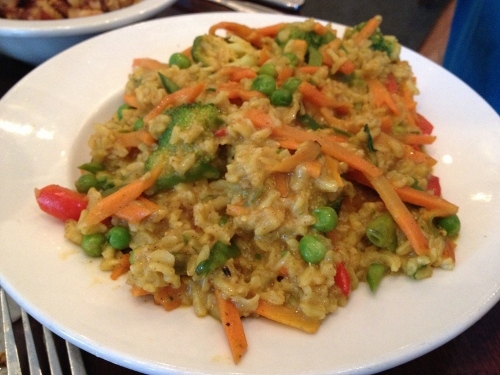 My favorite fella had the vegetable paella, which was a huge serving. I sampled it and it was very good, packed full of veggies. He said he would gladly eat this again. The only real concern I have eating here is with waitstaff. In addition to the aforementioned bread confusion, we dined with a friend who has a written list of her dietary restrictions/allergies. After the server verified what she ordered fit within the list, my friend offered to send the list to the kitchen, just so those preparing her meal were aware. 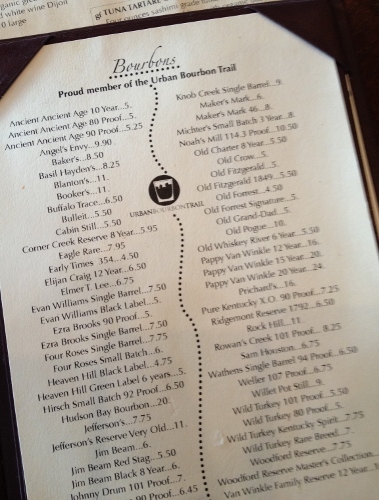 The server wouldn’t take the list to the kitchen. 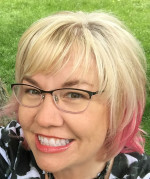 I would have felt better about eating there if the server would have done that, a little peace of mind goes a long way when eating with medically necessary restrictions. It’s fun to look around at Ramsi’s. The decor features artwork and souvenirs from travels all over the world. The original area of the cafe is lined with floor to ceiling book shelves. It’s just a fun place to look around in! 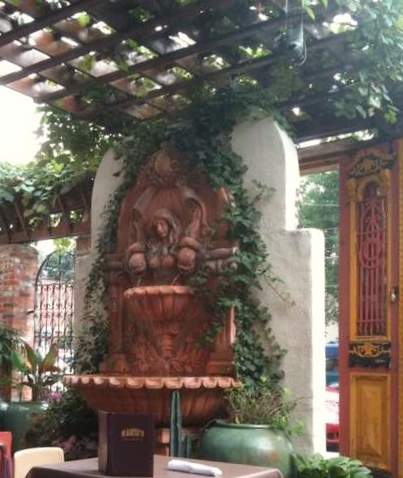 There is an outdoor seating area, with a fountain, that is also nice and great for people watching along Bardstown Road. Ramsi’s Cafe on the World is located at 1239 Bardstown Road in Louisville, Kentucky. Eat With: moderate caution. Be vigilant with your server, perhaps a little more insistent than usual to make certain your needs are communicated to the kitchen. The menu is labeled with gluten-free items but it is important you let your server know you are gluten-free. They have insanely good chicken sandwiches there, too! And the Hope Salad with Grilled Salmon is off the hook! It was funny, she was the ONLY server who did not take the list with her in an restaurant I’ve been to. Even when I ate there with my friend a couple of weeks before we met up with you, the server took the list. I think it was just her that night. I still want to re-create that drink! I’m almost out of Basil Hayden and I can’t drink again until I’m done with this Autoimmune Paleo Protocol. No fun! Miss you! I had a great experience there as well I was nervous though that my parents wouldn’t like it as much, since they’re not used to ethnic food. But they were happy! I’m so glad to hear you enjoyed it! I love that area of Louisville.